Body and Paint Repairs is an established and expanding car body shop in Warrington, providing high quality body repairs and paint spraying. All paint spraying is carried out in our purpose paintshop which houses the latest computerised low bake spray oven. All our paint spraying gear is regularly serviced, and we use the latest equipment available. 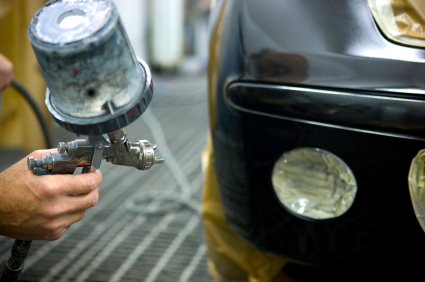 We have our own paint mixing facilities and use products from one of the world’s leading paint manufacturers, giving a first class paint finish to your car. Our computerised system ensures an exact match for the existing colour, with a perfectly smooth finish. We can confidently paint any vehicle including prestige cars (Mercedes, Audi, Volvo etc.) and car used for motorsport. Painting especially a good quality paint spray job is the finishing touch any body repair, but if done incorrectly can ruin the appearance of a vehicle or show problems after a few weeks. As the leading car paintshop in Warrington, we pride ourselves on our excellent quality and professional customer service. Our established and professional car body repair business specialises in prestige cars including BMW, Mercedes Range Rover and Volvo. We do car insurance repairs and smart repairs in our fully equiped premises. We do vehicle repairs including insurance approved body repairs for all makes including Volkswagen, Audi and Skodas. car spoiler, dent removal specialists uk, auction car salvage, car guide price used, Car body work repairs, car body paint repairs, van, Wrexham, Birchwood, Leigh, Wollston, Culcheth, Risley, Bolton Wigan Skelmersdale, St. Helens, Widnes, Runcorn, Lymm, Chester, Northwich, Altrincham, Sale, Hale, Hale Barns, Stockport, Cheadle, Salford, Knutsford. glass carrier van conversion, van lease, paint shop, skoda bodywork repairs, car price used, vw bodywork repairs, dent removal services uk, hailstone damage to car bodywork, audi bodywork repairs.